René Wolfram has been a professional day trader and swing trader for over 18 years. He is the only German trader who ever managed to reach the winners’ podium in the Robbins Worldcup Trading Championship, a 12-month trading world championship using real money. RealMoneyTrader is the name of his multi-year project during which René Wolfram coaches traders and allows them to see all his trades live. Available (for free) from René Wolfram in the NanoTrader trading platform. René Wolfram trades futures but it is also possible to use CFDs. Wolfram states: "I follow a statistics-based approach, trading both Break-out and Countertrend strategies. To implement the strategies I use futures, as they are by far the fairest product." René Wolfram is the only German trader who made it into the top 3 of the futures trading world championship. "In 2013 he finished third in this 12-month trading competition using real money. "Many of the strongest competitors in the championship, including trading legend Larry Williams, used volatility break-out strategies. In my case my break-out strategies were also a main source of profits." American traders have had a major influence on René Wolfram. "Larry Williams was a huge source of inspiration. He has had a significant influence on how I approach the markets", declares René Wolfram when discussing his development as a professional trader. This trader trades everything that is volatile and breaks out. From the DAX (FDAX) future -on which he unleashes his Vola Break-out strategy- and the S&P 500 future to the EUR/USD, gold, crude oil, coffee and wheat futures. Every instrument which is volatile attracts his attention. 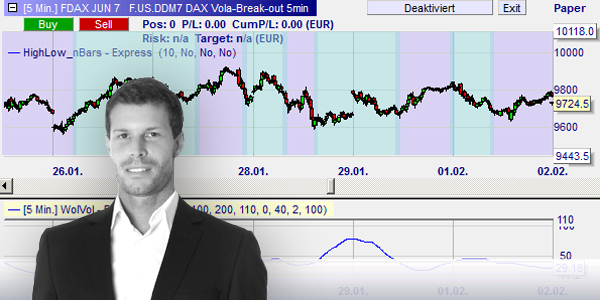 The Vola Break-out strategy is one of René Wolfram's favourite trading strategies. The strategy uses two indicators designed by René Wolfram: the WolVol and the nBar indicator. This very versatile strategy can be used in all time frames and on all instruments. René Wolfram makes the optimal settings available for four time frames (1', 5', 15' and 60') and six instruments (DAX, S&P 500, Nasdaq, gold, EUR/USD and crude oil). Usually trend break-out strategies have a high proportion of losing trades and a small proportion of big winning trades. For most traders waiting for these 'big winners' whilst consistently incurring small losses is mentally too difficult. René Wolfram had the same experience. To solve the problem he designed the WolVol indicator. The WolVol indicator identifies with precision the beginning or the first stages of a trend. The precision of the WolVol indicator is the reason why René Wolfram avoids many of the small losing trades associated with break-out strategies. This example illustrates the WolVol indicator. The beginning of a trend occurs when the indicator crosses its lower line upwards. The chart background will become green. In the illustration you can see four such occurences. The WolVol indicator alerts René Wolfram of a new trend. The indicator is not used to open a position. To determine the timing and the direction of a new position, René Wolfram uses his proprietary nBars indicator. The WolVol indicator also indicates the end of a trend. Hence René Wolfram uses his WolVol indicator to close positions. In this interview this professional trader provides answers to a few personal questions. The interview is in German. The Flat filter is a unique functionality in NanoTrader. The trader simply enters the time at which he wants an open position to be closed; the platform takes care of the rest. René Wolfram uses the Flat filter extensively. René Wolfram uses this strategy to occasionally short sell the GBP/USD ('cable' in trader slang) futures. This low-intensity strategy is easy to understand and implement. This low-intensity S&P 500 strategy is uncomplicated. One trading signal per day is the maximum. René Wolfram calculates his entry level on the basis of yesterday's market values. The entry levels are automatically shown as a trading range in the NanoTrader trading platform. This example shows René Wolfram's trading range. The trader has bought a long position. The market, however, goes down and the position is stopped out. All this can be automated in the NanoTrader Full. Try this strategy in a free NanoTrader demo. "It is simply helpful and comforting for me to have a professional by my side, who always supports me with good advice. Step-by-step I have developed a good overview of everything and now I know my way around." – M.X. "Your RMT project is something special and precisely what I have been looking for since a long time. ... Everything is clearly explained, well-structured and easy to understand." F.X. "The RMT project made my wish of being an independent and profitable trader come true and this in a fairly short period of time." – K.H. Discover a trading platform made by traders for traders... TEST the free NanoTrader demo.